Sliced​ beef or breast of chicken marinated in coconut milk with a hint of curry, skewered and grilled, served with peanut sauce and sour cucumber salad. Minced fresh water fish kneaded with chili paste, green bean, deep-fried to golden brown served with cucumber, sweet and spicy sauce and topped with ground peanut. Ground chicken breast with potato, onion and curry wrapped in puff pastry served with cucumber lightly sweet sauce. 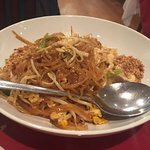 One of the most famous Thai dish; crispy fine rice noodle cooked with shrimp, minced chicken, fried tofu in semi-sweet tamarind sauce, topped with fried egg and serving with fresh bean sprout. Ground breast of chicken, shredded bamboo shoot, bean thread noodle and egg wrapped in spring roll skin, deep-fried, served with plum sauce. Fresh whole shrimp wrapped in spring roll skin, deep fried to crispy and served with plum sauce. Shrimp wrapped in fresh rice noodle, steamed served with light spicy soy sauce and fresh bean sprout. Soft white bean curd deep-fried to crispiness served with ground peanut and sweet sauce. Wonton skin stuffed with ground chicken breast, tasty and crispy served with Thai plum sauce. Steamed rice flour filled with ground breast of chicken, onion, ground peanut, palm sugar and minced turnip served with sweet soy sauce. The​ savory traditional chicken broth with your choice of shrimp or chicken, prepared with chili, lemon grass, kaffir-lime leave, straw mushroom and fresh lime juice. The most famous aromatic herb soup: chicken breast with coconut milk, kaffir-lime leave, galanga, and fresh lime juice. Ground​ chicken breast wrapped in wonton skin with boiled sliced chicken breast in home style chicken broth. Clear broth with roasted duck, Chinese cabbage and pickled lime. Seafood combination cooked in chicken broth with galanga, kaffir-lime leave, lemon grass, fish sauce, basil leave, scallion and coriander served in a funneled Thai steamboat pot. We use only top quality fresh chicken breasts, leanest beef and virtually fat-free pork in our preparations. Lettuce, tomato, onion, cucumber, fried tofu and hard-boiled egg topped with famous Thai peanut sauce. Shredded green papaya, fresh chili, garlic, tomato, peanut and fresh lime juice. Boiled ground chicken breast, shrimp and bean thread noodle delicately balanced with onion, chili, scallion, coriander, fresh lime juice and fish sauce. Roasted boneless duck with chili pepper, red onion, scallion, ginger, coriander, cashew nut, orange and fresh lime juice. Ground chicken breast seasoned with fresh lime juice, red onion, ginger, coriander, scallion, hot pepper and roasted, peanut. 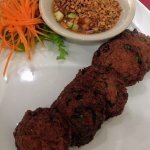 Sliced churl-broiled steak seasoned with Thai herbs, red onion, fresh mint leave, scallion, coriander and fresh lime juice. Cooked shrimp seasoned with red onion, fresh ginger, hot pepper, scallion, thin slice lemon grass, chili paste and fresh lime juice. Boiled squid seasoned with fresh lime juice, hot pepper, scallion, red onion, fresh ginger, thin slice lemon grass and chili paste. 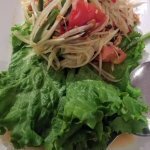 Grilled sliced beef with lettuce, cucumber, red onion, hot pepper, scallion, coriander, fresh lime juice and fish sauce. Shrimp, sea scallop and squid cooked with red onion, thin slice lemon grass, fresh lime juice, hot pepper, scallion, and coriander and chili paste. Your choice of chicken or beef sautéed with red curry, coconut milk, bamboo shoot, basil and kaffir-lime leave. Your choice of chicken or beef cooked in coconut milk and mixed with green curry, bamboo shoot, sweet pea, red bell pepper and basil leave. Choice of chicken or beef cooked in coconut milk and Massamon curry with potato, peanut and avocado. Your choice of chicken, beef or pork cooked in coconut milk and Pa-nang curry with red bell pepper. Your​ choice of chicken, beef or pork stirfried with red curry and green bean. 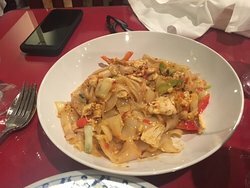 Your choice of shrimp or sea scallop cooked in coconut milk, red curry, bamboo shoot, red bell pepper, basil and kaffir-lime leave. Sliced breast of chicken cooked in Karee curry with coconut milk and potato, served with curried rice and cucumber salad. Boneless breast of chicken marinated in egg and chef's special spicy sauce, pan-fried to golden brown, served with sweet and spicy sauce and curry rice. Fresh steamed mussel from Maine on the half shell, served on a layer of Chinese bok choy and topped with Pa-nang curry sauce with shredded kaffir-lime leave. Jumbo shrimp battered, deep-fried and topped with sliced shrimp, onion, peanut cooked in coconut milk and Massamon curry sauce on a layer of Chinese bok choy. A half boneless, crispy duck topped with chef's chili sauce with basil leave, sweet pea and red bell pepper. 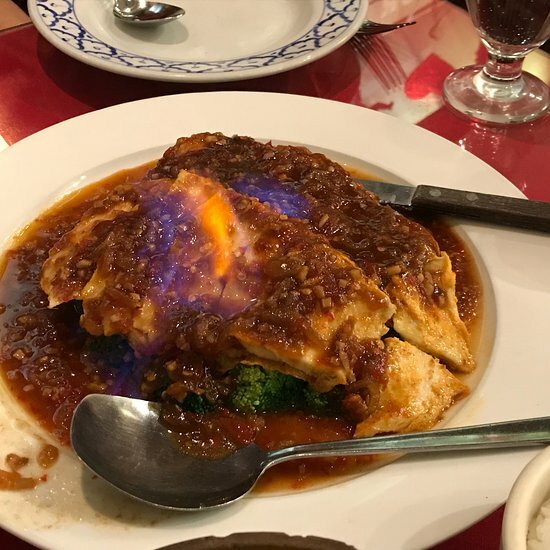 Sliced pan-fried chicken breast topped with sautéed hot and spicy sauce, served flaming. Sautéed​ shrimp, sea scallop, squid, jumbo lump crabmeat and mussel in red curry sauce, Thai herbs and coconut milk. 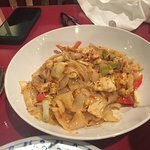 Shrimp, mussel, squid, jumbo lump crabmeat and sea scallop steamed in white wine, sesame oil, ginger, garlic and vegetables served with Thai hot and spicy sauce. Jumbo shrimp marinated with chili pepper, garlic and tamarind sauce served over broccoli. Stirfried shrimp, sea scallop, squid, mussel and jumbo lump crabmeat with red curry paste, fresh chili, red bell pepper, fresh basil and kefir-lime leave. Breast of chicken cooked in green curry and coconut milk with Thai eggplant, bamboo shoot, red bell pepper and fresh basil leave served on thin spaghetti. 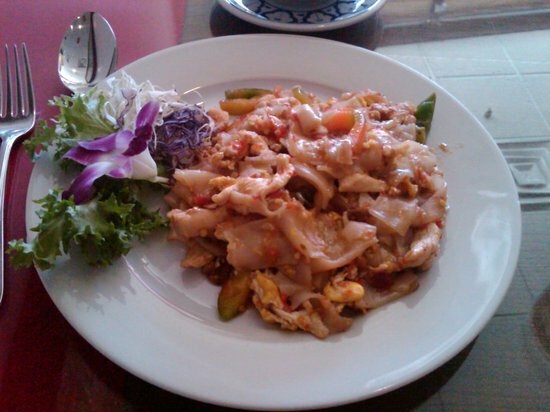 The most famous Thai fish dish. A whole fish deep-fried topped with chili pepper and garlic sauce. 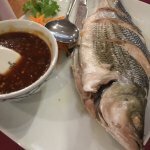 A whole fish deep-fried garnished with ground chicken breast, shrimp, baby corn, straw mushroom, carrot and ginger sauce. A whole fish deep-fried topped with fresh garlic and white pepper sauce. A whole fish deep-fried cooked in coconut milk with Pa-nang curry, red bell pepper and kaffir-lime leave. 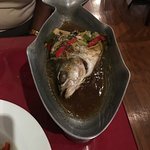 Steamed whole fish topped with Thai brown bean sauce, straw mushroom, celery, fresh ginger, scallion and red bell pepper. Fresh sliced salmon broiled, topped with ground chicken breast, shrimp, baby corn, fresh ginger, mushroom, carrot and scallion on layer of Chinese bok choy. Fresh sliced salmon broiled, topped with sliced shrimp, red bell pepper in red curry sauce and coconut milk; served on layer of Chinese bok choy. Fresh filet Tilapia broiled, topped with sliced shrimp, red bell pepper, sweet pea in green curry sauce and coconut milk, served on layer of Chinese bok choy. Sauteed squid with fresh garlic and white pepper sauce. Sauteed squid with basil leave, hot pepper and chili sauce. Sauteed jumbo shrimp with cashew nut, celery, straw mushroom, onion, scallion, red sauce and white wine. Sauteed jumbo shrimp with broccoli, snow pea, carrot, red bell pepper, baby corn, bamboo shoot and straw mushroom. Sweet and sour jumbo shrimp with cucumber, tomato, onion, scallion and pineapple. 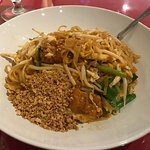 Sauteed jumbo shrimp with ground chicken breast; carrot, scallion, cabbage, straw mushrooms, egg and bean thread noodle. Sauteed jumbo shrimp with basil leave, hot pepper and chili sauce. Sauteed jumbo shrimp with fresh garlic and white pepper sauce on steamed broccoli. Jumbo shrimp and sea scallop stirfried with snow pea, straw mushroom, carrot and water chestnut in chef's special red sauce. Fresh asparagus stirfried with jumbo shrimp and chef's special white garlic sauce. Jumbo shrimp and bean thread noodle in a clay pot roasted with special sauce, Thai herbs and vegetables. Sauteed shrimp caressed by a savory chili sauce of pineapple, mushroom, onion, snow pea, red bell pepper and cashew nut. A half boneless, crispy duck topped with shrimp, bean curd and pineapple in red curry and coconut milk sauce. A half boneless, crispy duck topped with ground chicken breast, cashew nut, bamboo shoot, straw mushroom, carrot, baby corn and house special sauce. Roasted duck, boneless, sautéed in red curry and coconut milk with pineapple, cherry tomato, red bell pepper and fresh basil leave. Slices of deep fried tender boneless half duck, served over broccoli and topped with tamarind sauce. A half boneless duck sautéed with garlic and white ground pepper sauce. Famous Thai half boneless duck marinated, then deep fried to crispiness and served with chef's special sauce. Thai famous marinated beef with chili paste, garlic and white pepper served with special Thai hot sauce. Sliced chicken breast sautéed with cashew nut, celery, onion, straw mushroom and red sauce. Choice of chicken, beef or pork sautéed with garlic and white ground pepper sauce. Sautéed your choice of chicken, beef or pork with fresh ginger, onion, straw mushroom, scallion and red bell pepper. 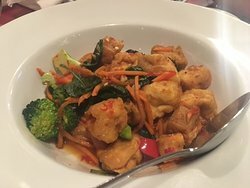 Sautéed​ your choice of chicken, beef or pork with basil leave, red bell pepper and chili sauce. Sauteed beef with oyster sauce, onion, red bell pepper and scallion. Marinated chicken breast, pan fried to golden brown, sliced, served over broccoli and topped with lemon sauce. 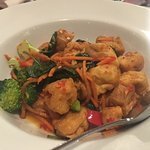 Choice of chicken, beef or pork sautéed in sweet and sour sauce with cucumber, tomato, onion and scallion. Tender chunk of top choice steak grilled, topped with chef's special brown sauce and broccoli. Sliced chicken breast sautéed with carrot, baby corn, snow pea, celery, tomato, onion and cashew nut. Tutti i piatti sono la rabbia! Chiunque sia un gamberetti e/o pollo buon piatto da delicato al piccante ed erano incredibili. Il servizio era rapido e il cibo era caldo e piccante al gusto. Questo ristorante dispone di diverse specialita' che era deliziosa! Porzioni abbondanti e buon servizio. Quattro di noi hanno apprezzato molto diversi antipasti, insalate e zuppe. Il nostro cameriere era attento senza essere invadente per il nostro pranzo d'affari. Bello, pulito e ristorante con ottima cucina! 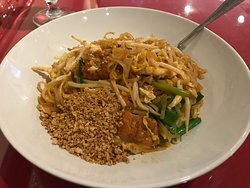 Ho provato un sacco di pad Thai prima di pollo e questa era una delle mie preferite. 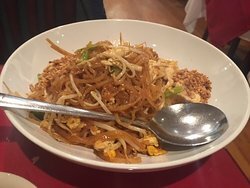 Ricevi risposte dal personale della struttura Bangkok Garden Thai Restaurant e dai visitatori precedenti.